With the holiday season coming up, I wanted to put together some fairly simple DIY projects that you can gift to your friends and family! This is also a very budget friendly project, and its a fun little afternoon activity. I saw these little dishes at Anthropology and they were sold out of the ones I wanted so I thought I would give making them a try! And they came out so cute. I can't wait to give them to friends! You can either do the horoscope of whoever you are giving the dish to (or yours if you're keeping it for yourself ;) or you can do a little celestial themed one like the moon and stars! I created all the designs for each sign below so you can have something to reference! So to get the celestial look, I wanted the bowls to have a blue tonal color mix. To do that, we are going to make a marbled pattern. 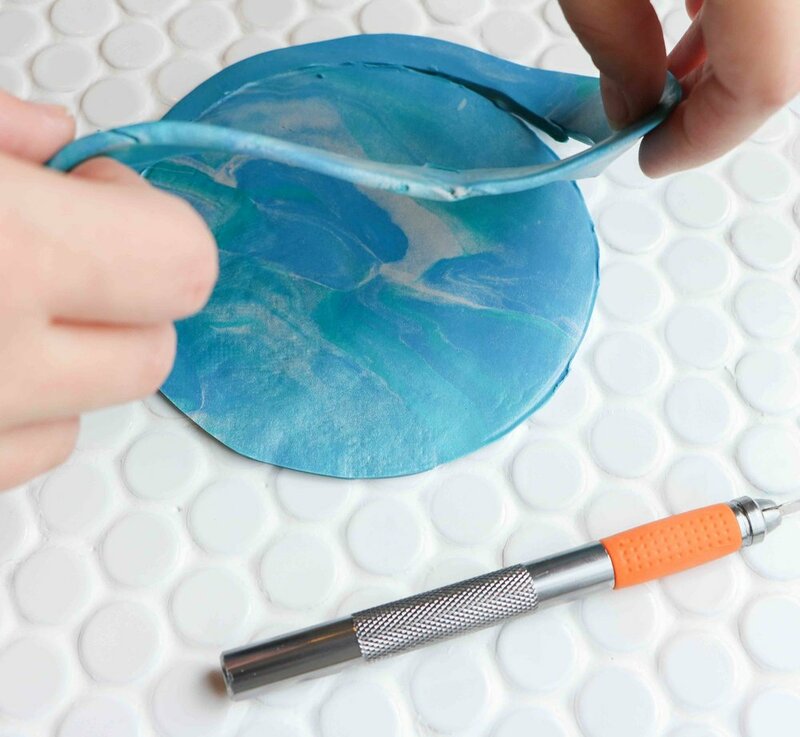 To start, you'll want to break off pieces of clay and start to roll them into 5-6" long strips. Which ever color you want to be more dominant, use the largest amount of that one. Once you have your clay strips rolled out (make about 5–7 of them), gather and twist them together multiple times. Then fold in half and twist a couple more times. There isn't and exact science to this, you can't mess it up. The more you twist it, the more of a marbled pattern you will get. Once all your stripes are twisted together, roll it up into a ball. After that, you'll want to flatten it out and use your rolling pin to roll it out fairly thin. About 1/8" thick. Once its rolled out, take your bowl and trace around it using your X-acto knife. Remove the excess clay once your circle is cut out. Once your circle is cut out, start to shape the clay around the outside of your bowl. Don't push too hard, you don't want to leave finger prints. Below is an alternative way to shape your clay into the trinket bowl. If you want flatter, less bowl-like shape, you can use your fingers like pictured to shape the sides. You'll want to use your thumbs and pointer fingers to pinch the sides to make the edges of the bowl. Whenever you have your dishes shaped, its time to bake them! Set your oven or toaster oven to 270° and place the the bowls on a tray and put them in for 13 minutes. Once they are baked, take them out and let them cool completely. Be careful! Use an oven-mit. Once they are cooled, you can paint the edges with your acrylic paint. I found it best to use a small flat paint brush for this part. Once the edges are dried, its time to paint the center with whatever design you want! Use the end of your small paintbrush to create the dots. To make the lines, I found it easiest to use a skinny pointed tip brush. Hope you enjoy! Happy holidays! Check back for more holiday gift tutorials soon!